You are here: Home / Rodeo Fan Blogs / 10 Tips for Your Visit to Cowboy Christmas! 10 Tips for Your Visit to Cowboy Christmas! It’s December 1 — and the NFR is only 6 days away! 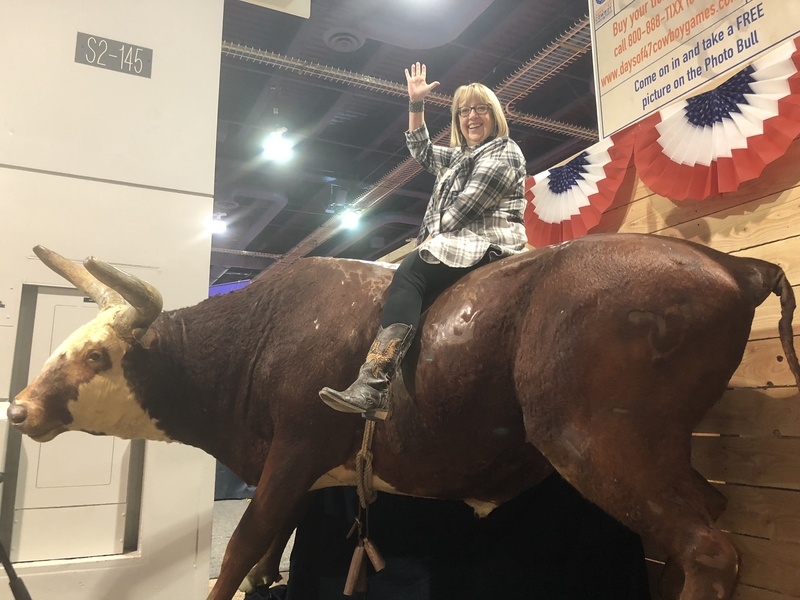 That means it’s time for me to start my Rodeo Fan Blog resolution – to blog from December 1 thru the end of NFR 2018. If you’re following some of the athletes on social media, you saw some horse trailers (rigs) leaving Texas yesterday headed to Vegas, and if you’re following your favorite Cowboy Christmas vendors on social media – they’re packing up and starting to get ready for the biggest event of the year. Here are this rodeo fan’s top 10 tips for visiting Cowboy Christmas! Get their early! 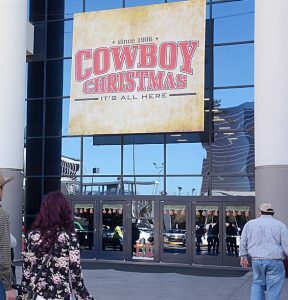 Cowboy Christmas is open from 9am to 5 pm at the Las Vegas Convention center — and if you want to take a leisurely stroll through the aisles and really “see” Cowboy Christmas – it’s easier to navigate early in the day! Don’t forget to pay attention to the new bag policy for Cowboy Christmas. They started the bag check last year, and honestly – it didn’t impact me much at all. Some days I went in with my sassy fringy western handbag (and let it be searched on the way in) – and some days I left my stuff in my clear plastic bag from the rodeo the night before – and just zipped in without a search. Don’t try to do it all in one visit. I know this depends on how long you’ll be in Vegas. If you’re going to be at the NFR for more than one day – schedule a couple of visits to Cowboy Christmas. If we’re there too long at any one visit, it’s inevitable that Mike is going to be mad at me for something. Cowboy Christmas in 2-3 hour visits make our NFR vacation much less stressful! 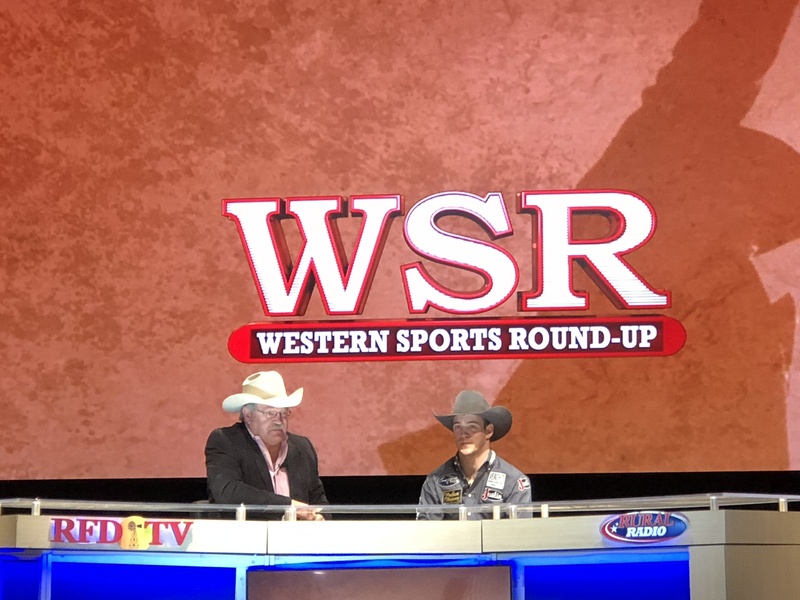 It’s a HUGE place, there’s shows to watch like Western Sports Roundup with Steve Kenyon – RFD Channel and Outside the Barrel with Flint Rasmussen. I was so busy shopping the first few years that I went to Cowboy Christmas that I didn’t schedule time for the shows. I was missing out. The shows are great, they give you an inside look at rodeo, and it’s a chance to rest your feet! 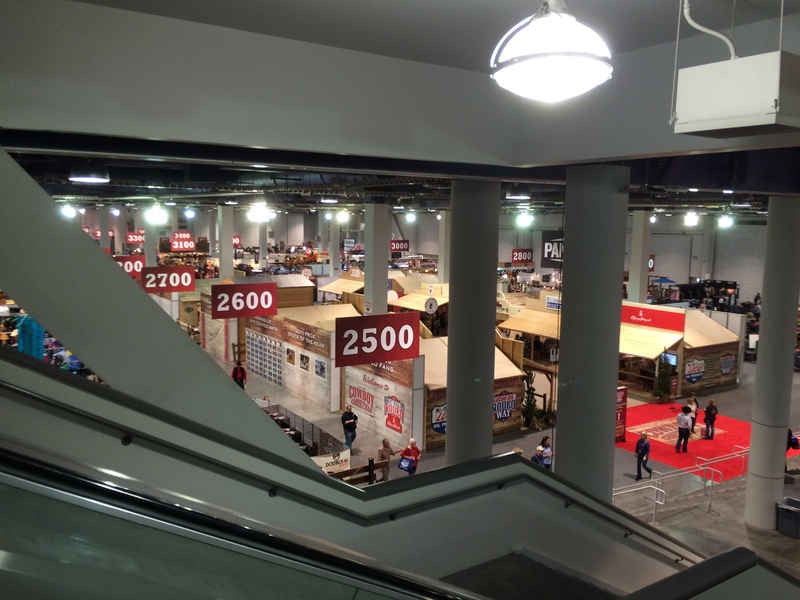 Upstairs in the convention center is the Junior NFR and the Rocky Mountain Elk Foundation show, and those are fun too! I’m guessing you’re starting to get the idea that you could spend each day walking around Cowboy Christmas and going to shows. You can’t really “see” Cowboy Christmas in a couple of hours. Wear comfortable shoes. Cowboy boots are great. Walking shoes are great. I walked around in my UGGs one year and my back started aching. I bought a pair of cowboy boots the next day, and wore them all day (and the rest of the NFR) when walking thru the exhibits. My back stopped hurting. I learned my lesson. Pay attention to the autograph schedules. 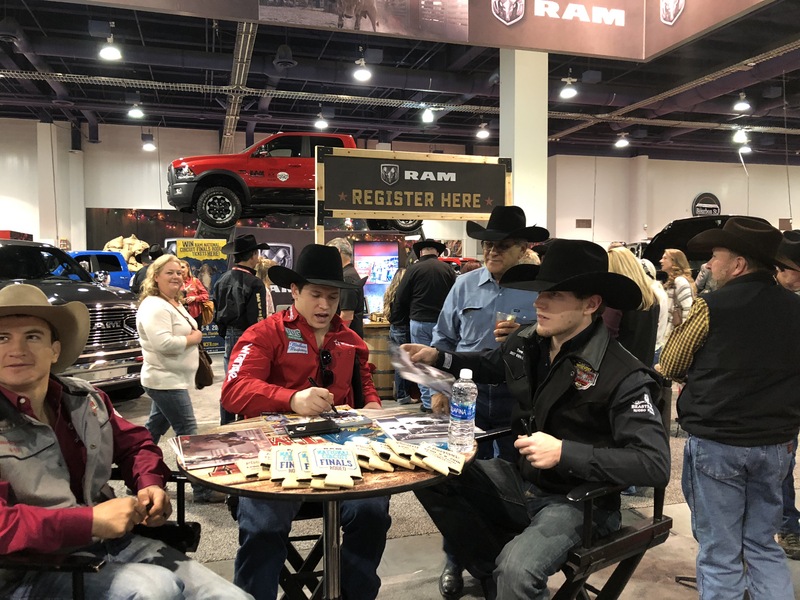 Each rodeo event has one autograph session where you can get autographs from all 15 athletes (and a poster of that year’s contributors.) Some are at Cowboy Christmas and others are at other venues around town. There’s also opportunities for autographs in many booths at Cowboy Christmas. When you walk by a booth and you see the schedule of who’s “signing” at what time — pay attention. If you have a favorite cowboy/cowgirl – they often post their schedules on social media so you will know where they will be. 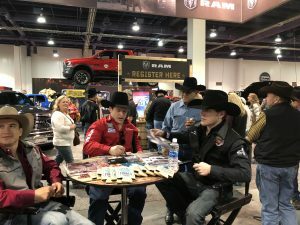 Professional rodeo athletes are some of the most genuine people I have ever met and if you happen on to one of these autograph sessions where there isn’t a line – you’ll get a chance to have a conversation and maybe take some pics with them. 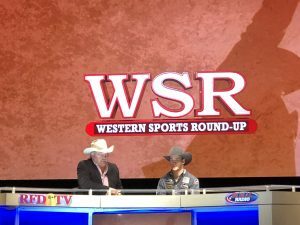 A few years ago we were walking around the RMEF show and 4x World Champion Bull Rider JW Harris was signing and there were no other fans around, so I had the opportunity to “fan girl” and talk to him about his ride from the night before when he won the round. It’s an opportunity that you don’t often get in other sports! Pay attention to aisle and booth numbers. If you’re walking around Cowboy Christmas and you see something you want to come back to, either write down the booth number or snap a pic of it. 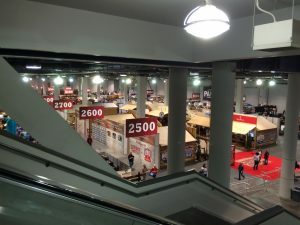 I know it sounds crazy — but things look different at different times of the day depending on how many people are walking around the show. The large numbers hanging in the aisles are “aisle numbers” — and they’re helpful for telling a friend where you are if you’ve lost them, or marking your progress if you’re trying to make sure you see everything. Spend some time on Rodeo Way! This “street” in an old west setting is near the east end of Cowboy Christmas and has areas for some of the largest rodeos in the US and Canada. Sign up for some great prizes or talk to the rodeo committee members if you’re thinking of planning a trip. Last year you could hold an alligator at the Ram National Circuit Finals booth, or you could get a photo op on a bull! The San Antonio Stock Show and Rodeo booth generally has authentic tamales or some other awesome food that represents their area – so it’s also a great place for a snack! Talk to people! Whether you’re talking to vendors, or the people sitting next to you at a show or at one of the tables near the concession booths – it always adds to your experience if you take time to talk to people. You could go buy a booth and say — oh that’s pretty jewelry — or you could stop and chat and find out that most of the jewelry in that booth is one of a kind and made by the person working in the booth! Whether you have a horse or not, the beautiful leatherwork on display at the custom saddle makers is worth taking some time to admire and you often get a chance to talk to the person that created them. Keep your eyes open! A couple of years ago we were walking around Cowboy Christmas and I saw Arnold Schwarzenegger cruising the booths. I was trying to “stay cool”, and figure out how to take a picture and get Mike’s attention to tell him it was “Arnold”, and Arnold and his security team kept walking and got by us without me getting a picture, and Mike only got to see the back of him. Rodeo is a sport with a lot of famous participants and fans – so that makes things interesting when you’re walking around Cowboy Christmas. Don’t make the mistake of thinking there’s only clothing and jewelry. One of the most unique things about Cowboy Christmas is the variety of vendors. Low end to high end. 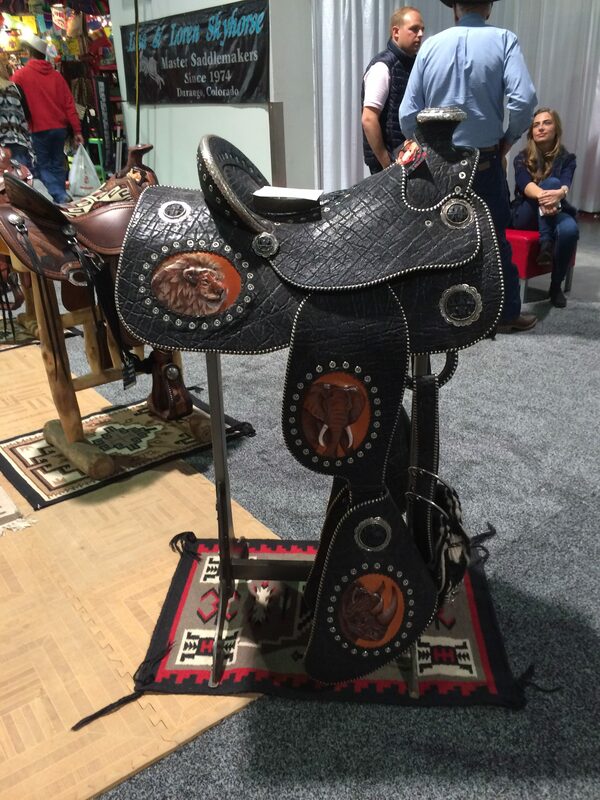 From cowboy boots to western furniture, to horse trailers, to furs, to Christmas ornaments, to trucks, to saddles and tack, to cowhides and cowhide purses, to vibration platforms — you just never know what you might see next! Your spouse may not want to stop at the same booths you want to stop at – so make a plan to meet up later! This makes sure you don’t have a spouse who’s mad at you when you get back to your hotel because he didn’t get to see what he wanted! Make sure your phone is charged or take a portable charger! The convention center is a big cement building, so your phone will be searching for a signal, and you don’t want to be lost from your family and then have a dead phone so you’re not able to text them! 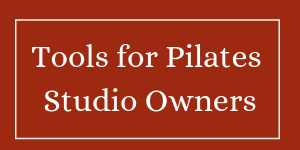 Previous Post: « Do you get tired of asking your Pilates clients to bring a friend to your Pilates studio?